We all like pizza. We all like robots, most of the time. But we definitely, absolutely, undeniably love pizza-delivering robots. Fortunately, Domino’s has built one. 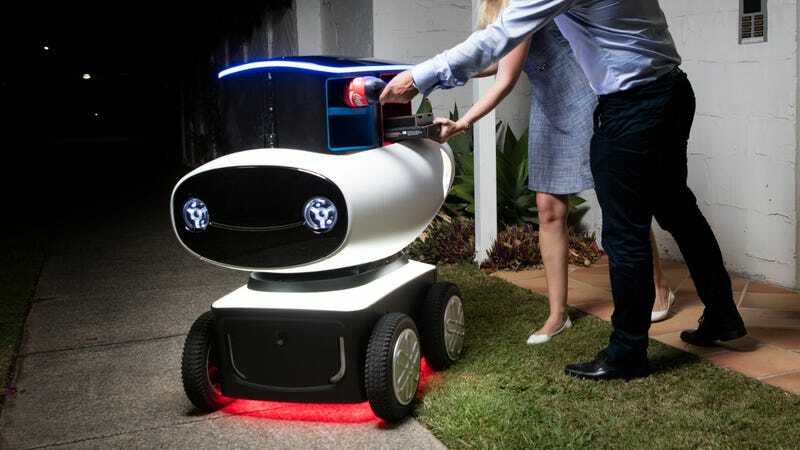 Domino’s has been working with Marathon Robotics to build this pizza ‘bot, reports Lifehacker Australia. Weighing about 450 pounds and measuring 3 feet in height, the robot—known as DRU—has storage hatches for pizza, drinks and whatever else you order. You’ll be pleased to hear that it stays locked until you enter a code that gets sent to your mobile, so pizza thieves are kept at bay. In terms of hardware, the robot uses LIDAR sensors to see the world that surrounds it and GPS to navigate to the customer’s door. It’ll cover 12 miles on a single charge. Lifehacker Australia refers to it as “a $30k military-grade robot refitted for pizza delivery,” which sounds just great to us. The pizza company has collaborated with the Queensland Department of Transport and Main Roads to ensure that it’s properly equipped to trundle around the city streets. So far it’s certified to navigate footpaths, trails, bike paths, and bridges, but it won’t be allowed on highways. Apparently the robot will actually start making deliveries in the next six months. Shame it can only bring your Domino’s.